1. 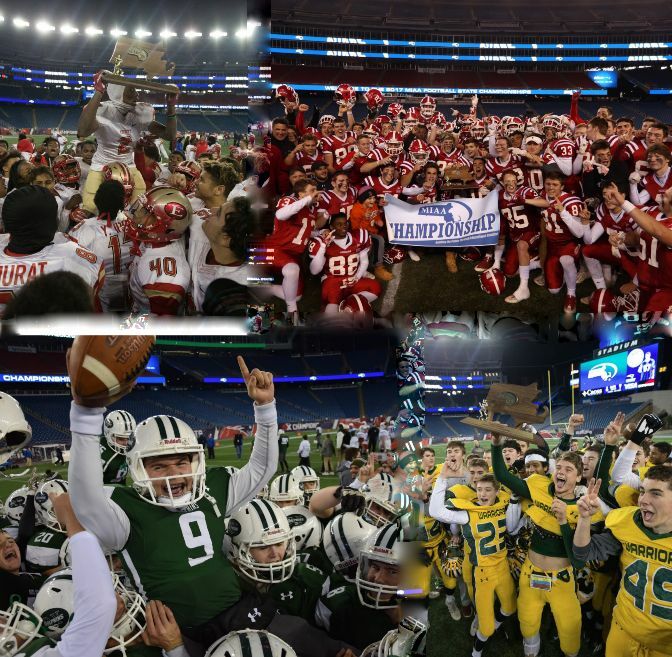 Everett (12-0; Last Ranking – 1) One of the greatest teams in state history, the Crimson Tide wrapped up back-to-back state titles with another convincing win, handling Xaverian 35-10 in the nightcap Saturday at Gillette Stadium. While other teams had great seasons, Everett as our statewide No. 1 was a no-brainer, given the Tide's year-long dominance, and sheer level of talent across the board. 2. King Philip (13-0; Last Ranking – 7) Winners of a state-best 25 games in a row, the Warriors managed to outlast Lincoln-Sudbury, 10-7, in the D2 Super Bowl, despite losing quarterback Brendan Lydon to a leg injury. What a turnaround by coach Brian Lee and his staff, taking the Warriors from also-rans to back-to-back champs in undefeated fashion. 3. St. John's (Shrewsbury) (13-0; Last Ranking – 5) With a 35-33 win over North Attleboro in the D3 state final, St. John's (Shrewsbury) finishes the season with 588 points, the second-most in state history. Quarterback Steven Bucciaglia set new CMass records with 45 passing TDs and 3,092 yards, in a senior season the exceeded lofty expectations. You can check out video highlights of both King Philip's and St. John's wins here. 4. Dennis-Yarmouth (13-0; Last Ranking – 8) Running back Rob Evans and quarterback Jacob McCarthy led the Dolphins to their first championship since the statewide format began in 2013. Along the way, D-Y defeated some of the best teams in the state, regardless of division, by a combined score of 523-146. If it wasn't clear before the postseason, it is now; this year's D-Y squad is one of the best in program history. 5. BC High (10-1; Last Ranking – 2 ) The Eagles exacted a modicum of revenge for their playoff loss to Catholic Memorial, handling the Knights in a 32-16 victory at Fenway Park. While a controversial early playoff exit bumps the Eagles down a bit, there's no doubt that Danny Abraham and company had one of the best overall resumes in the state. 6. Central Catholic (11-1; Last Ranking – 3) A late almost-comeback against Everett in the Division 1 North sectional final provides something of a moral victory for the Raiders, as their 37-29 loss is the closest any team came to hanging with the champs this year. 7. Lincoln-Sudbury (11-1; Last Ranking – 11) These Warriors played defending champion King Philip down to the wire in the D2 Super Bowl, but came up just short in a 10-7 loss. With a stacked junior class coming back, led by dual-threat quarterback Braden O'Connell, expect L-S to be right back in the mix for a state championship next year. 8. Xaverian (7-5; Last Ranking – 14) The Hawks came on strong during the second half, and came into the D1 Super Bowl guns blazing. But, like most teams, the Xaverian was simply no match for Everett’s high-powered offense in the D1 Super Bowl. 9. Lexington (9-2; Last Ranking – 4) With quarterback Sal Frelick, running back Ben Quint and wide receiver Anthony Bianchi leading the way, this was arguably the best season in program history, but Lexington had the poor luck of facing Everett in the second round of the state tournament. 10. Melrose (13-0; Last Ranking – NA) Finally breaking through after Super Bowl losses in 2014 and 2015, Tim Morris and his staff rode junior running back Isaac Seide (184 yards, 2 TDs) to a 21-0 victory over Nashoba in the D4 state final. 11. Middleboro (10-3; Last Ranking – NA) With their best three players healthy at the right time, the Sachems blazed through the D6 state tournament and won a state title for the first time since 1983. 12. Mashpee (13-0; Last Ranking – 19) Blackstone Valley Tech proved to be a stiff challenge for the Falcons in the D7 Super Bowl, but Devaun Ford and company prevailed in a 22-16 victory for the program’s third consecutive state title. 13. Millis (12-1; Last Ranking – NA) Bryce Latosek quarterbacked the Mohawks to a second consecutive state title, passing for 164 yards and 3 TDs in a 37-0 thrashing of Hoosac Valley on Saturday. 14. North Attleborough (11-2; Last Ranking – 10) The Red Rocketeers offense held its own, but the defense simply couldn’t get a key stop against St. John’s (Shrewsbury) in the D3 Super Bowl. 15. Bridgewater-Raynham (10-2; Last Ranking – 6) For the second straight year, the Trojans came up just short against a transcendent talent in Shane Frommer, losing to King Philip in the D2 South sectional final. 16. Tewksbury (10-2; Last Week – 13) Seemingly always in the thick of the race for a state title, the Redmen did well to advance to the D3 state semifinals, where they fell to North Attleboro. 17. Hopkinton (11-1; Last Ranking – 24) The Hillers simply couldn’t match points with Melrose in a 22-8 loss, denying the program its first trip to Gillette Stadium. 18. Marblehead (10-1; Last Ranking – 9) The Magicians fell to eventual Super Bowl champion Melrose in the D4 North final, but bounced back with a 28-14 win over rival Swampscott on Thanksgiving. 19. Lynn English (10-1; Last Ranking – 20) After a heartbreaking loss to Tewksbury in the D3 North final, the Bulldogs demolished crosstown rival Lynn Classical, 38-0, on Thanksgiving. 20. Catholic Memorial (7-4; Last Ranking – NA) After stunning BC High with a last-second Hail Mary to make the D1 South sectional final, the Knights came out flat against a resurgent Xaverian team. 21. St. Mary’s (Lynn) (11-1; Last Ranking – 18) The Spartans came up just short in the state semifinals against a Mashpee program with plenty of championship pedigree. 22. Nashoba (10-2; Last Ranking – NA) Unfortunately for the Chieftains, starting quarterback Sam Bolinsky suffered an ankle injury early in the D4 Super Bowl against Melrose, torpedoing their offensive game plan. 23. Springfield Central (8-3; Last Ranking – 25) The Golden Eagles flew threw the Division 3 West bracket, but couldn’t handle the elite spread offensive attack from St. John’s (Shrewsbury) in the state semifinals. 24. Boston Cathedral (10-2; Last Ranking – NA) Led by incredible running back Khalil Blair, the Panthers had one of the best seasons in Boston City League history, but couldn’t get past defending champion Millis in the D8 state semifinals. 25. West Springfield (10-2; Last Ranking – 25) Overmatched in the D5 Super Bowl against Dennis-Yarmouth, the Terriers still had a season of which to be proud. Steve Buck 3,601 passing yards this season. You are out of your mind ranking Central Catholic behind anyone besides Everett. They were the second best team in the State. Who did the other higher ranked teams beat? Other D2, D3, D4, D5 teams? Why not schedule Everett, Central Catholic, St John's Prep, or BC High. If the AD's really wanted to see if they had the best team in the State, they would schedule the Power House teams during Non-Conference gameplay. Everett, Central and other top teams have a tough time finding non-league games because nobody wants to play them and blemish their record. Central plays a tougher schedule as demonstrated by power rankings, conference and division. BC High also plays a much tougher schedule than those other higher ranked teams. C'mon Man! Rob, your argument is not very compelling. The Merrimack Valley Conference is one of the toughest in the State and Central also plays St John's Prep and Everett yearly. I'm not saying there aren't some good HS football teams out there, but Central was scoring an average of 44 points a game and letting up under 10 against a quality conference and tough non league opponents. Also, as stated in the article, "their 37-29 loss is the closest any team came to hanging with the champs this year." On another note, Suite Sports, you do a great job covering HS football (minus your rankings :), keep up the good work.